NEMO Moonwalk Sleeping Bag. The first sleeping bag with a waterproof tub design, the Moonwalk™ can be used directly on the ground. An ideal pairing with our new Apollo™ shelter and Escape Pod™ bivy. Drawstring collar seals in body heat, while the hoodless design saves weight and bulk. Pad sleeve loads from above, maintaining the waterproofness of the tub design. Waterproof/breathable footbox protects against tent wall condensation. 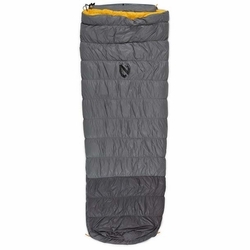 Moonwalk™ is NEMO's bikepacking sleeping bag solution thoughtfully designed from head to toe.